Discovered by E.E. Barnard in 1890. In 1890, American astronomer E. E. Barnard, observing visually with the Lick Observatory 36-inch telescope in California, discovered an exceptionally bright nebulosity adjacent to the bright Pleiades star Merope. 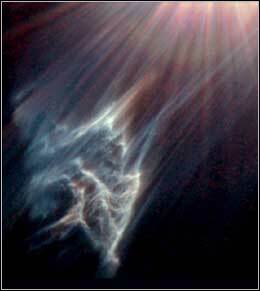 It is now cataloged as IC 349, or "Barnard's Merope Nebula." IC 349 is so bright because it lies extremely close to Merope -- only about 3,500 times the separation of the Earth from the Sun, or about 0.06 light-year -- and thus is strongly illuminated by the star's light. NASA's Hubble Space Telescope has caught the eerie, wispy tendrils of this dark interstellar cloud being destroyed by the passage of one of the brightest stars in the Pleiades star cluster. 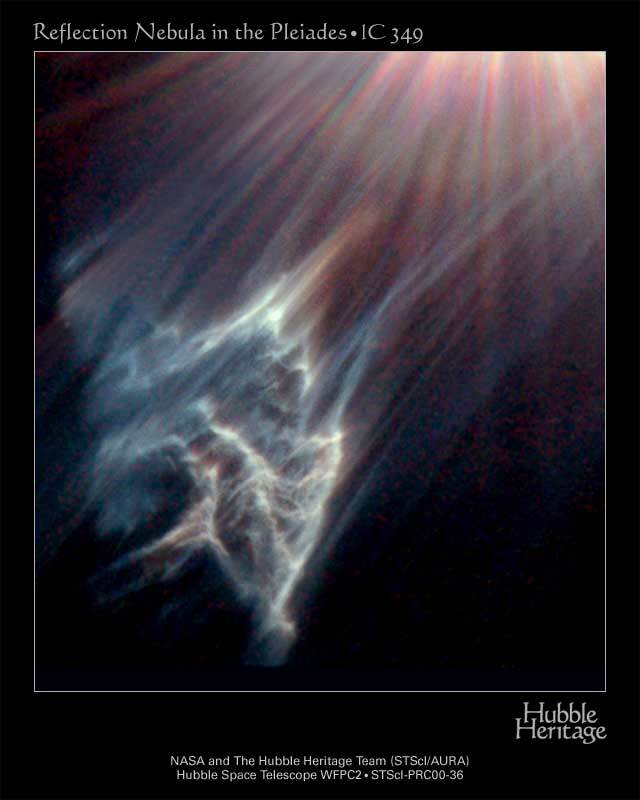 Like a flashlight beam shining off the wall of a cave, the star is reflecting light off the surface of pitch black clouds of cold gas laced with dust - these are called reflection nebulae. Over the next few thousand years, the nebula--if it survives the close passage without being completely destroyed--will move on past Merope, somewhat like a comet swinging past our Sun. This chance collision allows astronomers to study interstellar material under very rare conditions, and thus learn more about the structure of the dust lying between the stars.